Get a same day repair solution, Sunday through Saturday. The most vital part of your automatic garage door system is the opener. The springs have their importance, don't get us wrong. But without the motor and the circuit board (the two main part of the opener), the automation of the overhead door would be impossible. 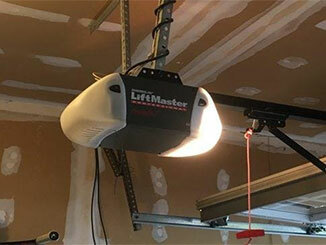 A garage door opener in good condition should work quickly and smoothly every time you use it. If the opener makes noise, moves slowly and doesn’t always work, you need to get it checked. If you’re ever in need of garage door opener repair services near Yonkers, you’ve got us to call on. From broken gear replacements to circuit board troubleshooting. Any service you need is available. Electromechanical devices like this one can experience problems. When you realize a garage door opener is not working, you can try some troubleshooting. Your owner’s manual will have some tips on that. But replacing broken gears or chains, or fixing trolley connections and electrical wires requires the help of a pro. When garage door opener repair services are called for, there’s one nearby company you’ll want to actually call. That’s us, Garage Door Repair Yonkers. If the opener has no power, or it’s not working at all, contact us for a same day service response. It’s important to ensure your garage door opener continues working smoothly. When minor problems turn up, they need to get fixed quickly, to keep more serious issues at bay. Misaligned garage door opener sensors can cause a reversing door problem. The condition is sometimes referred to as a 'false-positive'. That means the garage door opener will not close the door. It will reverse when you try to close it. This type of problem often involves the garage door sensors, but not always. There are plenty of other issues that can crop up. Professional opener troubleshooting can root out their sources. Garage Door Repair Yonkers offers this service every day of the week, so reach out to us for any opener repair need you have. If you want to upgrade to a new opener model, the experts at Garage Door Repair Yonkers can help. There are all sorts of options to choose from. Chamberlain garage door opener models and those under the LiftMaster or Genie brand have a lot of features to offer you. But you can divide most available models to three different types. A new chain drive opener offers reliability and strength. However, it also makes more noise than the other types. A belt drive opener model can operate without making nearly any noise at all. It is going to cost a little more, though. A screw drive garage door opener works very quickly. It is the fastest of the three main types. It doesn’t require a lot of maintenance. But it can be noisy too and can cost more than a chain drive opener, on average. This part of getting a new opener is important. It can influence how many problems you’re going to have to deal with in the long run. Making sure your new garage door opener is installed by local pros means you’ll avoid all sorts of problems down the line. You can be a DIY enthusiast, but opener installation isn’t the type of project that amateurs should undertake. Improper installation can lead to more problems and even some dangerous issues. Best to avoid it, and leave this type of task to the experts. You’ve got a nearby garage door company to call on, so don’t take needless risks. Keep your Yonkers home protected with a state of the art garage door opener from one of the major brands. Get in touch with us to consult with an expert on which opener is best for your needs. If you live near this part of New York then the help you need is already close to your area. If your garage door opener is slow and noisy, or just doesn’t seem to work right, leave it to us. The pros here at Garage Door Repair Yonkers can repair any type of opener and will replace motor gears or circuit boards, as needed. Contact us anytime, including on Saturdays and Sundays. Same day opener repairs are available seven days a week.